Nicholas Kovacev, a Malden native, earned his Doctorate of Physical Therapy from Franklin Pierce University in 2016. 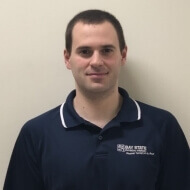 Prior to completing his graduate work, Nick received his Bachelors of Science in Kinesiology from the University of Massachusetts in Amherst, MA. As someone who has participated in sports throughout his life, Nick’s primary interest in physical therapy is outpatient orthopedics with an emphasis in sports injuries including both non-surgical and post-surgical rehabilitation. He has a special interest in ACL repair and rehabilitation as it is an injury that he has experienced himself, giving him a deeper understanding of what the patient is experiencing and what they should expect during the rehabilitation process. Nick enjoys staying current on the latest treatment techniques and increasing his knowledge and skill set through continuing education courses. In his spare time, Nick likes to stay active with exercise and hiking. He is a big fan of Boston sports and you can occasionally find him at a Patriots or Bruins game.